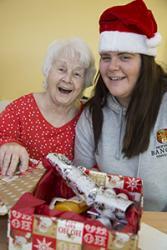 Wrexham student nurses' generous Christmas donations from BCUHB on Vimeo. 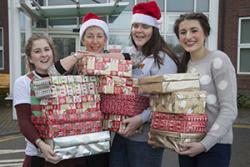 Second year adult nursing students Ceri Davies, Kate Topple and Fern Williams, along with their lecturer Angela Williams, have filled shoeboxes with festive treats for patients on Bedwen, Onnen and ENT wards. The shoeboxes include a range of gifts approved by Ward managers, including toiletries, colouring books for adults and Christmas decorations. Student nurses at Wrexham Maelor hospital delivering Christmas gifts to patients on the Bedwen and Onnen long stay rehab wards. Pictured is Ceri Davies delivering a gift to a patient.They have been presented to patients at Wrexham Maelor Hospital after Ceri was moved by patients without family to visit them during her time on the ward last Christmas. Ceri said: “I was on placement at the Maelor last Christmas, and saw patients who didn’t have any family who were missing out on company. “We decided to take it one step further this year and make them some small Christmas hampers, just with simple presents just so they know we are thinking of them. Donations were collected from students at the University’s School of Healthcare Sciences, with further gifts donated by management at the new Aldi store in Wrexham. In addition, Ceri has also distributed this week 22 filled children’s shoeboxes to a local homeless shelter. Angela Williams, lecturer in adult nursing at Bangor University, said: “We originally set out to fill 60 boxes, but we filled a lot more just through donations made by students, friends and other lecturers. Their generosity has been absolutely incredible, and we can’t thank them enough. Gill Harris, Executive Director of Nursing for Betsi Cadwaladr University Health Board, said: “The effort the girls have made to spread some cheer to our patients this Christmas is absolutely fantastic, and I commend them for the outstanding care and compassion they’ve demonstrated. The School of Healthcare Sciences at Bangor University has campuses in both Bangor and Wrexham, and covers the entire Betsi Cadwaladr University Health Board region. The department is ranked third in the UK overall according to Times Good University Guide 2017, and had a 100 per cent employability record from 2015 graduates. As well as Nursing, Midwifery and Radiography courses the school has launched an innovative BSc Transforming Health degree for 2017 which will appeal to those interested in a variety of health related careers.